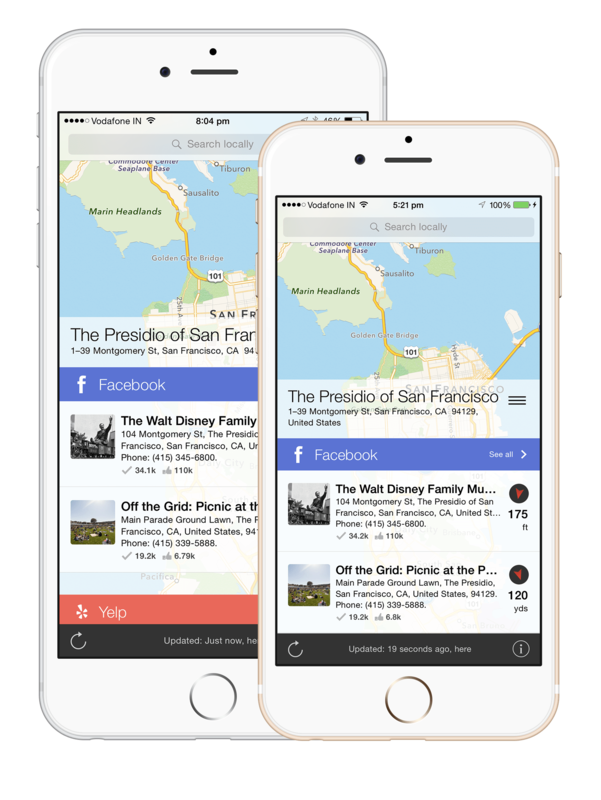 v4.3 now enables users to book an Uber cab to search results directly from within the app. Each result in Localscope now has an option to “Book a ride to here” via Uber. This means you can not only call the business or look up directions, but you can hail an Uber by tapping a button in the detail page of a result. This action will open up the Uber app if its installed on your iPhone with the pickup and destination addresses pre-filled. You simply have to choose the type of Uber you’d prefer to travel with and hop on your ride to get to the location. If you don’t have Uber installed, Localscope will direct you to their mobile website to complete the reservation process. iOS users who do not have an Uber account can even use Apple Pay to sign up and pay for their Uber ride without having to ever pull out their wallet. Localscope users from 300 cities across 58 countries covered by Uber can now use the “Book a Ride” feature. More cities and taxi service integrations will follow soon. Localscope is the most inter-connected location app on the iPhone that collects and connects local data in uniquely useful ways. Now with on-demand taxi service integrations starting with Uber, Localscope lets its users book a ride to a place found in any of the top 20 location services in just a couple of taps. v4.3 packs various improvements to the search results from Google and Facebook - results are much more closer to your location and are more locally relevant now. The Wikipedia source too has been fixed and now works globally. You can now fire up Localscope to read about interesting places around you using the Wikipedia source. Zomato results too have been refined - Web links to a place and to the food menu work like a charm now. A big shoutout to the Zomato team who helped in improving the experience of browsing a Zomato location in the Localscope in-app browser. We’ve also added a link to open a Zomato location in their app directly. Tap on “View Venue” in the detail view of a Zomato result and check out photos of the place, read reviews and get more information. Along with the above updates, the Picasa source has been removed from Localscope as Google has discontinued the Picasa API. We are hoping Google gives us a Photos API with geo data soon. Factual and YouTube have been temporarily disabled as their APIs have some momentary issues. Once the issues are resolved from their end, they can be turned on from the Discover and Search settings within Localscope. We’ve also finally made a preview video for Localscope with a catchy tune for the App Store. Check it out and let us know what you think. If your apps are not set to update automatically, head to the App Store and get your Localscope update now. For those of you who are still waiting to try out Localscope, now is the best time!